I'm convinced if I could bottle my kids' energy and sell it, I would be a billionaire. Unfortunately for me, I haven't figured out a way to bottle that energy so I'm forced to try to burn it out of them. I think all mothers can agree that there is nothing worse than kids cooped up indoors for days due to rain or snow. In my neck of the woods it's usually rain that keeps us indoors. When my son was first learning to walk his physical therapist recommended that we create obstacle courses for him to navigate. I'm a good little mommy and I made one the next day and I discovered something; obstacle courses are fun for all my kids and they burn energy. Talk about a win/win situation. Now your obstacle course can be very simple like the one that I made today. Or you can make an elaborate course that requires more than 30 seconds of set up. Really the choice is yours. I'm tired today so I went the lazy route. All you need is at least 4 different activities to keep the kids entertained. This was our course today. You want to walk the course with the kids so they know what to do. Then send each kid though a practice course. I keep the kids entertained for more than 2 runs by making the course a competition. I time the kids each round and declare a winner. I like having a winner each round since eventually each of my kids will win. Plus they want to go again so they can win again after they lose. Burning off excess energy is the main benefit of an obstacle course but it's not the only one. All kids need to work on gross motor skills and an obstacle course is a great opportunity to work those skills. They can hop on one foot, skip, balance a book on their head, really the possibilities are endless. It is my experience that my son's motor skills are improved the most when he's having fun and not thinking about the skill. Obstacle courses also teach sequencing which is a very important skill for young kids. It may not seem like a big thing to learn, but sequencing is tough for many kids. 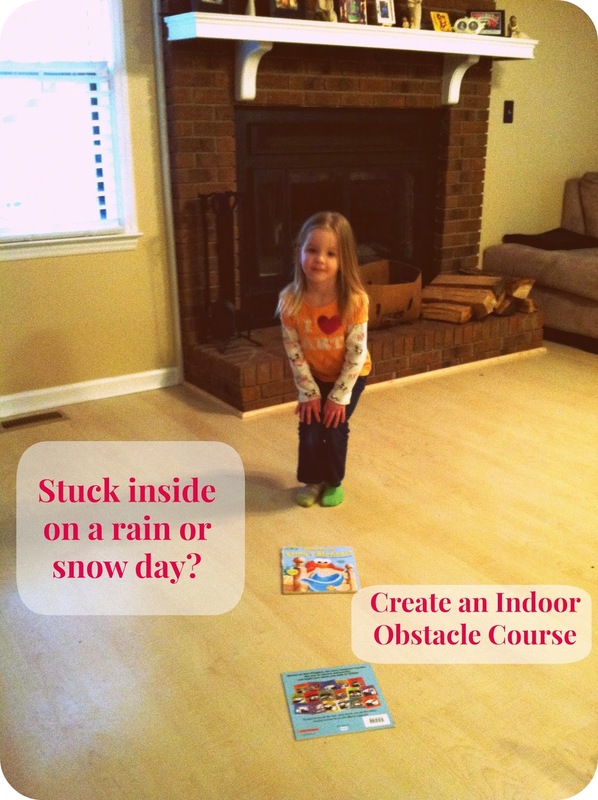 Now pin this activity for your next rainy or snowy day. The kids will have fun and you just never know your kids may actually nap. Right now my kids are napping which makes it worth every single one of those 30 seconds I spent setting up the course. I'm going to bask in my victory now; naps are rare in my house.